Recently, the drugstore has forayed into a space that used to be filled only by higher end, higher cost brands: The makeup setting spray. When it comes to my summer makeup routine, I've always loved to use a setting spray on the days when I know my makeup is going to be put through it because it means that I won't end up looking like a hot mess by the end of the day. Until now, I've always used the Urban Decay All Nighter Makeup Setting Spray and been very happy with everything but the price of it. So when lower cost options were offered at the drugstore? SOLD! Within a few months, L'Oreal and then Hard Candy released their own setting sprays and I absolutely had to see how they stack up against each other. Keep reading for my comparison! From the pictures, you can tell that these two look very, very similar with all black packaging and white text with bright accents. The main difference for me, aside from the size, is the finish on the bottle. The L'Oreal has that sort of rubberized matte finish to the bottle, which I think makes it feel a little higher end, but is also annoying because it is pretty much instantly dirty and impossible to wipe clean. 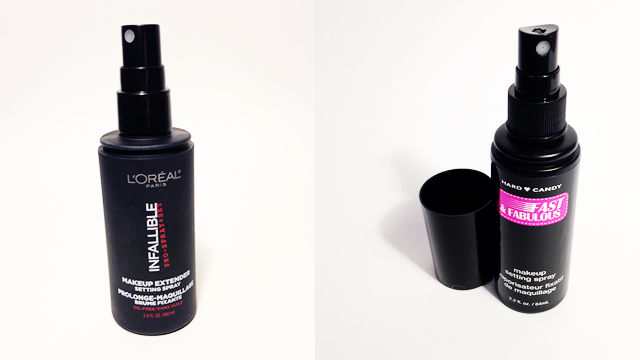 Either way, the L'Oreal packaging is just that bit nicer. For testing and comparison purposes, I've worn these setting sprays both on their own and at the same time on opposite sides of my face. When I started this comparison, I felt like these were going to perform very differently, because used alone I always felt like the Hard Candy Fast & Fabulous was a little bit more matte than the L'Oreal Infallible. Strangely enough, when worn on opposite sides of my face, the two products performed exactly the same, from finish to wear time. However, I do feel like there is going to be a definite element of personal preference when it comes to these. I feel like the Hard Candy can be a little more drying on the skin and ultimately feel a little more uncomfortable to those of us with normal to dry skin, but could ultimately be a dream come true for someone with oily skin. On the flip side, I've heard some people with oily skin complain that the L'Oreal leaves them too dewy and doesn't hold their makeup in place, but for those of us with drier skin that can be a good thing. I think these are both actually really good setting sprays. Like with any setting spray, I wouldn't wear them every day, since they do contain alcohol and can end up being drying, but I think both of these do what they set out to do with fairly equal performance. For a budget option or oilier skin, I would recommend the Hard Candy, but if you're willing to spend a little more in the drugstore and have drier skin I would recommend the L'Oreal. My personal preference, oddly enough since my skin runs normal to dry, is the Hard Candy and I have a feeling I'll get a lot of wear out of it this summer. 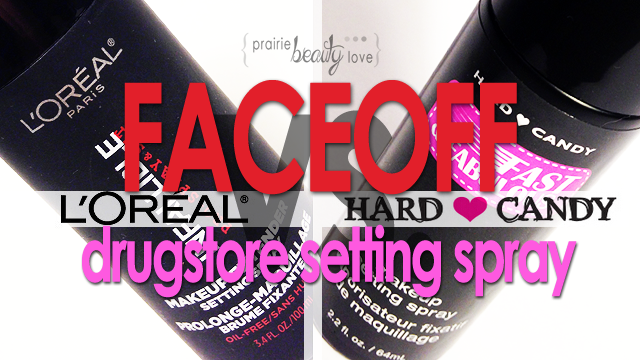 I hope this was helpful and I'd love to hear if there's any other Drugstore Faceoff's you'd like me to do in the future!